Hesitation and dubious drive steered by the world’s most democratically elected communist government stood shaken under the glare and reprimanding tone of the declining superpower United States in connection with official statements issued by Nepal’s ruling party and prime minister. Suffering from the drought of convincing issues like a drowning man catching at a stray, the main opposition Nepali Congress leaders cried hoarse: “Why such hurry in issuing a statement over a development in far-off Venezuela ?” They reminded that the US was a long-time aid provider. Prime Minister KP Oli and his Nepal Communist Party’s statements and clarifications proved to be an unseemly filp-flop. Erasing institutional memory or pretending non-existence of the past is a blatantly bizarre effort by the imbecile. A nation’s policies, and institutional structures and memories enrich contemporary times. In Nepal, Nepal Communist Party (NCP) and Nepali Congress are both engaged in the atrocious audacity of rejecting history as reference points. Girija Prasad Koirala set the tone for Nepali Congress in the 1990s. UML emulated the Congress and, subsequently, Maoists jaywalkers intensified the process. 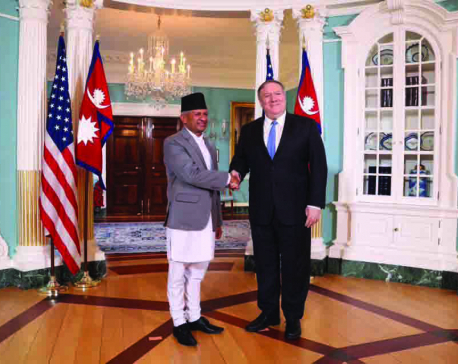 That is why an invite from the US government to Foreign Minister Pradeep Gyawali for a Washington visit caused big celebrations by a government starved of such gesture. On the eve of the 1971 Indo-Pakistan war over an emerging independent Bangladesh, Nepal sent identical letters to India and Pakistan expressing concern over the warlike rhetoric the two non-aligned nations traded. When Sheikh Mujibur Rahman declared Bangladesh independent, India was the first to accord recognition. Resisting New Delhi’s pressure, Kathmandu showed no rush in following suit. An unhappy Indira Gandhi government then nudged Bhutan to recognize the new nation. As a reward, the Indian government permitted the Druk regime to invite Bangladesh to open an embassy in Thimpu and become the second country to do so in that landlocked nation—a situation maintained to this day. Closely committed to proactive non-aligned foreign policy, Nepal did not hesitate to express concern over the 1968 Soviet intervention in Czechoslovakia. Whereas India, which tried projecting itself a non-aligned movement leader, sided with the now-defunct Soviet Union’s machination for regime change in Afghanistan in the winter of 1979. Nepal did not hesitate to echo its displeasure, though pro-Soviet communists and intellectuals like Nilamber Acharya sided with Moscow. During bilateral meetings and one-on-one sessions with Nepal’s monarchs, New Delhi regularly complained against Nepal’s voting pattern not matching with its international stance. Rana Prime Minister Bir Shumsher’s interest in visiting Britain in 1896 was “supported” by the new viceroy Lord Elgin, only to get scuttled because of the Nepali ruler’s insistence on receiving a 31-gun salute as against the offer of only a 19-gun salute by India Office in London. Today, Nepal’s image in the comity of nations has dipped drastically. The country stands among the most ignored nations. King Mahendra was invited twice to the United States—the first included a rare itinerary to address a joint session of the Congress. His successor King Birendra visited various world capitals. This contrasts sharply with loktantrik Nepal that has hosted only a handful of foreign heads of state and government. Its president and prime minister rarely receive invitation by their foreign counterparts for official visits. This contrasts heavily with previous decades. King Birendra’s Zone of Peace Proposal was endorsed by countries from all continents and all veto powers at the United Nations, except the Soviet Union—India’s “special, special” ally. 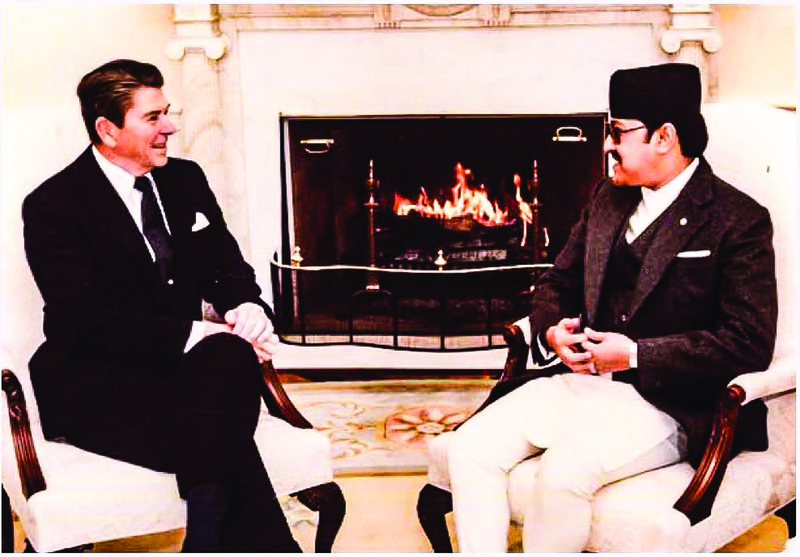 During King Birendra’s state visit to the US, the Ronald Reagan administration accorded ZOP the recognition. Revising its stance, the Soviet Union, too, had indicated its recognition would be announced in 1990 during the Nepali monarch’s planned visit to Moscow. But the course changed when multiparty system was restored that year and the interim cabinet headed by Krishna Prasad Bhattarai put the ZOP issue under the carpet, as he did not wish to “displease India so early after it helped restore democracy”. Girija Prasad Koirala and all his successors took it as a good riddance of an issue that New Delhi intensely disliked. Consequently, Nepal’s international credibility slid and eroded. A total of 116 nations had endorsed the proposal made on the occasion of King Birendra’s coronation in 1975 in the presence of the largest number of royalty, heads of state, leaders of government, ministers and celebrities from all over the world in Kathmandu. Former Maoist leader Baburam Bhattarai recently tried atoning for his past lapse. “The peace zone proposal floated by [the] late King Birendra should be revived and forwarded. It’s high time we made some efforts towards this end,” he said. However, the former prime minister’s remark, made with the wisdom of hindsight on the eve of India’s January 26 Republic Day, hardly found any mention in the mainstream media. The Himalayan Times was among the exceptions. On January 19, The Rising Nepal reprinted a 1969 news item that read: “The Soviet ambassador in Kathmandu Mr. Dzioubenko called on Foreign Secretary Y N Khanal to apprise him of the Soviet viewpoint on the recent events in Czechoslovakia.” These days, which foreign ambassador in Kathmandu bothers to call on a government secretary? Some major powers draw their battle lines for a new strategic thrust, with long-term interests and immediate priorities. They work overtime amid the challenge of assuring that they are not “mere fair-weather friends. Pretenders to non-existing expertise fail like the recent Thugs of Hindostan, a big budget multi-starrer feature film churned out by Mumbai, the capital of world’s largest cine-industry. Nepali Congress leader Krishna Prasad Bhattarai, on being appointed prime minister the second time, made a cryptic comment on an academic duo that left his residence after submitting their interest in being appointed ambassadors appointment: “Two big thugs of Nepal have just left.” One of the two was a professor of English literature and the other, also a professor, was a political scientist. What are diplomats made of? Knowledge, skill and patience with the knack for presence of mind and play of words at the right time, marked by the right pitch and pause together with a perceptive power of critical analysis for reports back home. A few are good for long innings in different roles. King Mahendra spotted and appointed Yadu Nath Khanal to various posts and his successor Birendra gave the policy continuity to the extent that Khanal was made advisor by Girija Prasad Koirala in the 1990s. Practicing diplomacy is one thing whereas purely academic knowledge is another aspect, even if complementary to each other. Some possess only a long quality, which might just about be passable. A very few might be endowed with both the credentials, which is fine to begin with; and many aspirants have neither, which is often the case in Nepal. Language is very important but not the only criterion. An ambassador’s appraisal and appreciation of local issues and analytical power is craved for more than anything else. Nepal’s mainstream party leaders squirm in their seats of power and privilege when faced with a series of foreign policy successes recorded in previous decades compare starkly with their own performance today. They skip many issues treated as taboos never to be acknowledged. In one of the oldest states in the world, contemporary Nepali leaders present a ridiculous stance of owning up foreign policy history of primarily the post-2006 political changes. 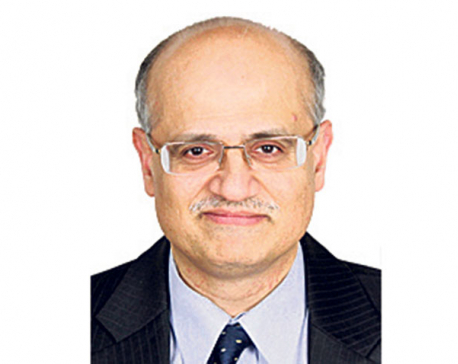 Frozen feats are bound to bounce back for the natural order of rediscovery linking past contributions that the present crop of leaders shies from duly acknowledging. Selective memory won’t work.